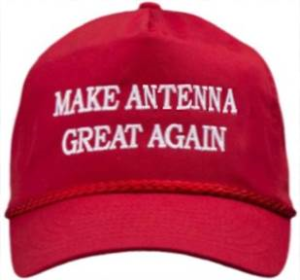 Make Antenna Great Again ! These should be great times for people engaging in Over-the-Air (OTA) testing. First, the standardisation of a measurement procedure for radiated performance of MIMO devices has been brought to a successful ending. O.K., it took some time to get there, among others by the, for outsiders astonishing, struggle seasoned experts had with the proper definition of something basic like SINR in emulation settings. Now, add to this success the prospect of no antenna connectors being present any longer in 5G New Radio (or no physical RF interface being standardised, for that matter), so all testing, even of protocol stacks, should go Over-the-Air and a bright future for the discipline can be forecast. However, not all is rosy. In standardisation, having a standardised measurement procedure does not imply that mandatory specs are coupled to the measurement results. A point in case is the SISO OTA procedure that determines the Total Radiated Power and Total Radiated Sensitivity/Total Isotropic Sensitivity of handheld terminals. The key parameter in both quantities is the antenna efficiency. Gert Pedersen, co-chair of the IC1004 SWG on MIMO OTA, once stated that in his opinion, an antenna efficiency of a mobile terminal in the hand at the head of -6 dB is really good engineering. Simulations by Vince Lau, chair of the IC1004 SWG on Antennas, also indicated this -6 dB is about the best one could do. Picture this: wasting 75% of the available RF power in your antenna is first class engineering. Note the GSM developers anticipated in the standard losses of up to 50% as a realistic average. The reality is, though, that the close proximity of large volumes of conductive dielectrics (head and hand) plays havoc with the current distributions and the radiation of (integrated) antennas that perform splendidly in free space. So, a premium terminal has in the GSM band a TRP of +33 dBm – 6 dB = +27 dBm for nominal RF amplifier output of +33 dBm? Not quite, most terminals have RF stage output at the lower limit of +31 dBm to save battery charge. However, the graph below of actually measured TRP values of handheld terminals  tells that those 2 dB are not the main problem, some terminals even struggle to get 1% of the power radiated! If your guess is, premium terminals are predominantly present at the right hand side of the graph, you are right. In addition, the differences between left hand and right hand use are obvious. Not every single measured TRP value in the graph is undisputed, but it is clear that on average, losses are much higher than nominally 8 dB (TRP of +25 dBm). It will not come as a surprise that, even after 27 years of GSM specs, still no decision could be reached in standardisation on a mandatory TRP lower limit as the commercial risks for some of the manufacturers are simply too high. Sadly, for LTE the situation is quite comparable. What does this tell us? Presumably, customers too easily assume that premium products of fashionable design with newest and catchy software are premium in all aspects. Generally, bad coverage is attributed to the network provider, not to the terminal, but is not of sufficient concern to put pressure on providers. Network providers could ban underperforming equipment from their networks and inform the public, forcing the manufacturers to improve on radiated performance, but at present, the stakes seem not to be high enough. The major problem on the horizon is that “the industry” gets used to the fact that business is not affected by bad antenna performance, as the “systems”, including the customers, seem to have sufficient redundancy and headroom to absorb additional losses. But, recently, warnings were issued that with 5G the paradigm of link transfer characterisation shifts from “How good is my signal?” for past and present system generations to “Where is my signal?”. This is due to the beam-steering mode of operation that is necessary, as no headroom is available at millimetre wave bands. Then, loss of beam tracking easily equates to loss of connection. The lesson learned in the early days of mobile communications is that if customers complain, lost connections rank at number one. Would this increase the stakes for the network providers? One thing is for sure, with the advent of 5G, it will be moving times for OTA research. Anders Karstensen and Gert F. Pedersen, “Over-The-Air Evaluation and Ranking of Mobile Phone Performance”, 11th European Conference on Antennas and Propagation (EuCAP), pp. 3668-3672, Paris, France, 19-24 March 2017.